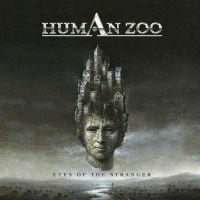 HUMAN ZOO sure stands out. Not many hard rock bands employ a saxophone player these days, or ever before. The band history starts in 2004 and comprises two previous albums, their debut “Precious Time” (2006) and the follow-up “Over the Horizon” (2007). The basic formula is simple but seemingly secure: They go for a steadfast 80´s hard rock sound, with the addition of the occasional sax. I think they have done well, sporting three albums in only five years, plus numerous gigs with the likes of THE SCORPIONS, AXXIS, KROKUS and U.D.O. The line-up has been a solid affair comprising of vocalist Thomas Seeburger, guitarist Ingolf Engler, Keyboardist Zarko Mestrovic, bass player Markus Ratheiser, sax player Boris Matakovic, and drummer Kevin Klimesch. This is one of those albums. I tend to come across ten to twelve a year. Apart from the in some circles obligatory short intro this is solid and retro in the right way. There is the lukewarm ballad “Everything Changes”, but apart from that there are no weaknesses in my opinion. Seven standout tracks is a hard feat to copy in 2011, while three of the remaining four are solid, but not eyebrow raising. “The Answer” makes me wonder why GOTTHARD broke it big and not this lot, “Gimmie Your Time” dares to sound like the best 25 years back in time and “Fall in Love” is a deadringer fro the golden age of David Coverdale´s songwriting and Y&T´s best songs. The voice of Thomas paired with hit feeling and some (I didn´t think I´d ever say the words) well placed and sufficient sax parts. Congratulations, this one goes to the Best of 2011 list.